Winter Dogsledding - Jasper Adventure Centre. 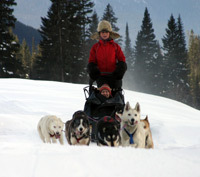 Ever thought of driving your own team of Alaska sled dogs up a pristine mountain valley? Well, this is your chance! Our day’s adventure starts with a relaxing scenic drive through the Yellowhead pass en route to the ultimate method of backcountry travel. After a brief instruction period, guests will have the opportunity to drive their own teams of 6-8 dogs past frozen waterfalls, snow-covered trees and through open meadows. The abundance of wildlife practically guarantees a sighting! Command your own sled or simply snuggle up in the blankets provided and soak up the incredible scenery. Travel time to Dogsled staging area is approximately 90 minutes. Please be prepared for winter mountain driving conditions if you choose to drive yourself. Moonshiners of Whiskey Creek: Travel by dog team through the silent undisturbed beauty of winter and all it has to offer. 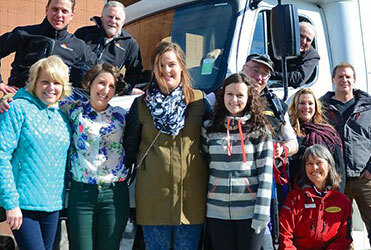 This is a great hands-on opportunity to venture deep into the heart of the Canadian Rockies. Enjoy the crisp mountain air and the beautiful scenery that surrounds you while you warm up with a hearty trail side lunch, cooked over an open campfire, hot apple cider and homemade treats. During this time you will have the opportunity to learn the history of both the area and the art of dogsledding. This has quickly become our most popular tour!! For inquiries or reservations please call 1-888-786-3641. 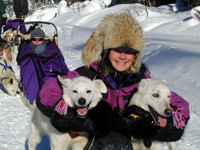 The 60 Minute Musher: This tour is great for those groups that are large or families with small children that want a quick taste of dogsledding. Trip includes your introduction to the dogs, the equipment, your instruction on how to drive a dog team, and 1 full hour of mushing! It concludes with a hot beverage and homemade treats back at the trail head. *All participants must read and sign aliability waiver prior to going dogsledding. *Very important participants are dressed inproper winter attire *boots. *Very important to stress the importance of a big breakfast before coming out as our bodies’ require calories to stay warm.